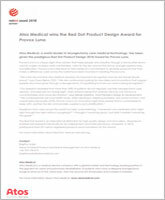 Atos Medical, a world-leader in laryngectomy care medical technology, has been given the prestigious Red Dot Product Design 2018 Award for a second time, now for Provox Luna! Provox Luna is a unique nighttime solution that is designed to help people who breathe through a stoma after larynx cancer surgery to sleep more comfortably, care for the skin around the stoma and get superior lung humidification. Provox Luna is the result of Atos Medical’s commitment to develop products that truly make a difference. Users across the world have been involved in creating Provox Luna. The Provox Luna Adhesive has an innovative soft connector and is made of hydrogel. Hydrogel is widely used in wound care and has proven cooling and soothing effects. The Provox Luna HME is made of soft silicone and provides superior humidification. It has a low breathing resistance for comfortable breathing. 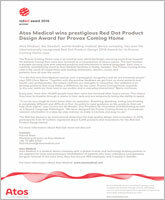 Atos Medical has won the internationally recognized Red Dot Product Design 2016 Award for its Provox Coming Home case. The Provox Coming Home case is an intuitive tool, which facilitates returning home from the hospital for patients having their voice box removed as a consequence of larynx cancer. The tool includes a durable carrying case with selected products and information in several languages. Each case is carefully assembled by hand at Atos Medical facilities in Horby, Sweden. The Provox Coming Home case is the result of cooperation with leading institutions, doctors, nurses and patients from all over the world.